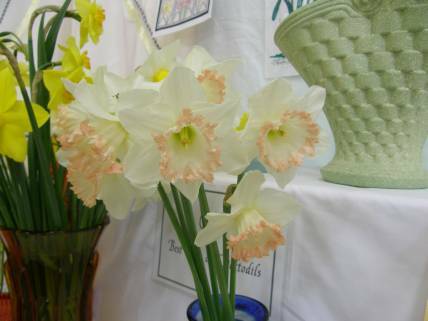 All Saints Anglican Church is hosting its third annual Daffodil Show. The weekend of 21 & 22 September 2013 will see All Saints Church and Hall bedecked in the glorious colours of daffodils together with a display of historic stained glass. Come and learn about growing, breeding and showing daffodils or book a tour and see for yourself the fascinating process of restoring All Saints Church. Family entertainment will include face painting, Zoodoo Petting Zoo, live music (Ethereal CelticHarps, debut Tasmanian performances by Melbourne vocal trio Alf and organ recitals), a garden market, The Jesse Tree (All Saints Gift & Op Shop), and a food court featuring BBQ, vegetarian, Pakistani, morning & afternoon tea with homemade cakes. Community Classes for young and old range from a simple arrangement of garden flowers in a vase to photography, original artwork and colouring-in for all ages. Flowers and vases are available on request. Budding artists are encouraged to either colour in an original line drawing by Rod Barwick or create their own original work. Plant a Wheelbarrow is our newest Community Class. The theme for your wheelbarrow masterpiece is the Mad Hatter’s Tea Party. It’s time to dig that old wheelbarrow out of the corner of your garden and start planting a tea party extravaganza. So dust off your old teapots, coffee pots and vases, dig out your wheelbarrow, pick some flowers from your garden and arrange them at the show. Not only will you be part of a wonderful community event but all proceeds go towards the All Saints Church Restoration Appeal. A building too precious to lose.